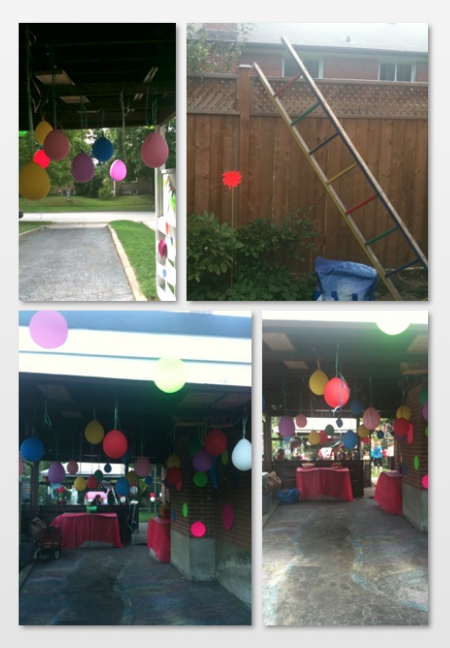 Kids birthday parties can easily get quite expensive but you can do it much cheaper by just adding a bit of extra creativity to the mix. This idea might be a bit more effort but we did it in the weeks prior bits at a time and considering the money it saved, was well worth it. 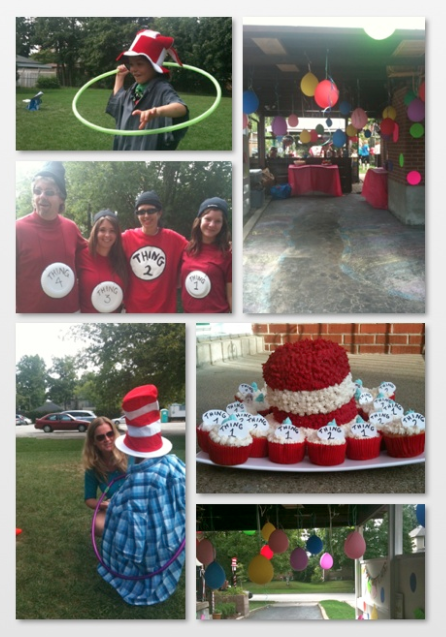 Below is a snapshot on how we created something out of hardly anything and had one of the best birthday parties around! 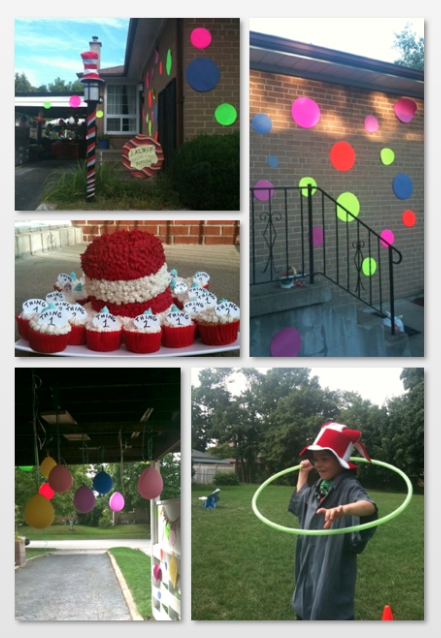 Start by placing poster board polka dots everywhere outside the house to create excitement for the party as soon as guests arrive. BUY sheets of poster board from the dollar store and cut out two sizes that using a template could typically get 4-5 polka dots out of each piece. Adhere using duct tape. An exact replica of “Oh the Places you will Go” chalk path lined the driveway to guide you through. As you passed through the balloon forest, favorite quotes of Dr. Seuss on wild scrapbook paper were plastered everywhere to get you in the mood. 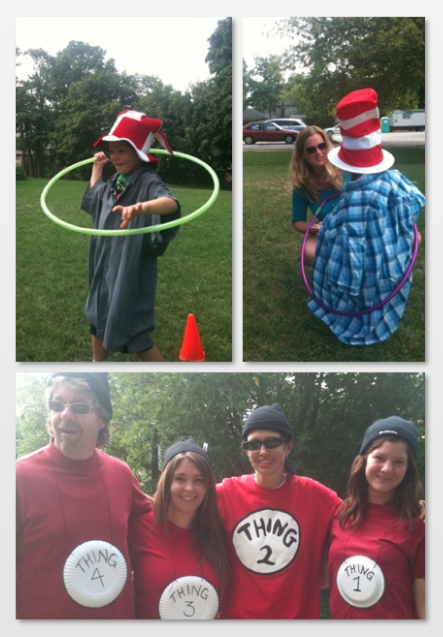 For the décor, we looked around what we had in the house and with a little finesse turned the backyard into Suessville. We stuck an old tricycle upside down in the bush, created Truffula trees out of cardstock and ribbon, used coloured tape (a roll can be bought at the dollar store) and wrapped our ladder, plastic baseball bats, garden stakes, Styrofoam balls we painted, and more…we then scattered around the backyard with toys, kitchen utensils, etc..in random, upside down ways to play up the whimsy that Dr. Seuss brings to the party. Of course Green Eggs and Ham as well as many colourful dishes that rang true to the bountiful colours Dr.Seuss uses in his books. The fill for the Green eggs was devil eggs that we added in some green food colouring and piped back in with an icing piper. Simply two round cake mixes that were cut to give it a little lopsided affect. 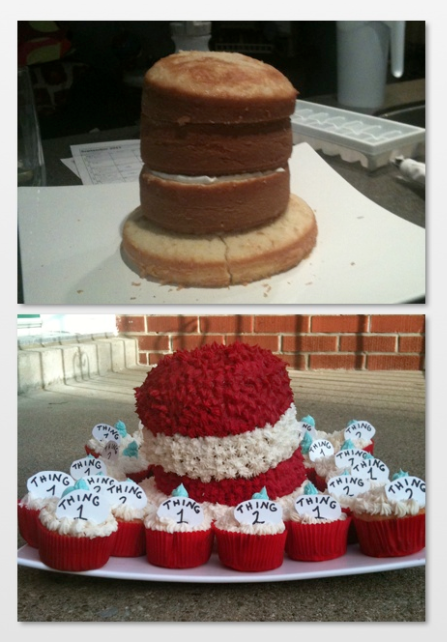 We then iced in red and white layers and surrounded in Thing 1 and Thing2 cupcakes. It did take a fair amount of red food colouring (and a bit of beet juice) to get the red that red but was well worth it. Dear friends dressed up as the Thing family to add to the theme of the event. We have a trampoline that we decorated as the cage in the zoo complete with striping every post.